Here we are with the Autumn edition. This must mean that summer is almost over. I hope you have all been out and about in your Beaufords enjoying what little bit of summer we had. Please let us know where you've been and what you've seen. On 26th July we joined several other club members at the Duxford show. As well as the aircraft in the hangars and outside to look at, there were flying displays by WW2 planes and plenty of classic cars to look at. OVENDEN’S	OFFERING	Liz Goodness, it does not seem five minutes since the last magazine came out and yet here we are again. I am writing this just two days before we are due to go off on holiday and as an extra problem have just had some new acrylic nails which look very nice but are not that easy to type with, so please excuse any typos or unusual words which may appear as Microsoft (as a lot of you probably already know) has a habit of thinking it knows what you want to type which is not always correct. Anyway, as I was saying, we are off on a little jaunt in a couple of days’ time. I have a cousin who lives in a castle in Aberdeen and we are going up to visit him and his wife for a few days. It’s a bit of a family reunion as four of my cousins are also going. Quite amazing what you can organise when you’ve had a few bevvies (our last get together in Essex in March)! Not only that but we have agreed to go up in the Beauford, so rather than do it in one go we will stay overnight in Carlisle. Just hope when we get there they do not put us in the basement room as I believe it is still fully equipped. You may remember that last year I mentioned about the Beauford overheating and how we put a heat shield in. Well it does seem to have helped, but when we went down to Duxford, on a very hot Friday afternoon, the car did start to play up when we got caught in traffic so Tony has now put in an Oil Cooler, so hopefully this will finally do the trick, although I am not expecting very hot weather in Aberdeen in September, but you never know. Over the last few weeks I have had a couple of phone calls from Beauford owners who have never joined the Club, but expect the same level of help as those who regularly pay their subs to stay as members. When I asked one why he did not join I was amazed at how quickly he changed the subject, and it was at this point that I decided that perhaps I would not be quite as helpful as I usually am. After all we have a loyal membership and I think that they should get preferential treatment. This brings me to be subject of regalia etc as I have now worked out prices for members and non-members as agreed at the AGM. I had an email the other day from a member who wanted to convert his bonnet sides to those with the dummy exhaust pipes. It’s not something I have thought much about but on talking to Tony about it and then emailing back it’s quite a complicated and possibly expensive thing to do. Involved in this would be the purchase from Beaufords of the side pipe kits, plus also new bonnet sides and then the drilling of the holes in the front wings which if you don’t get right first time could be a bit disastrous. I’ve not heard back from the people concerned but I wonder whether they decided to go ahead, and if so, how much did it cost and how easy was it to do. and return to me. This could possibly make my life a lot easier and save all those hours I spend sending out reminders. Regalia/Spares Headlamp rims I now have a fresh supply of headlamp rims. Unfortunately, the cost has gone up, both for the manufacturing of the basic rims and for the industrial chroming. Flying Lady bonnet mascots I am hoping that I may be able to get a few flying lady bonnet mascots manufactured shortly. Because I only want a few, and as a big favour to me, the company I use has agreed to do me a few, but on the condition that I may have to wait a little while until they are less busy. I do have orders from two members but will let you all know when I get the other ones in. New Tax Disc Rules I have just discovered that with effect from 1st October this year, the DVLA will cease to issue tax discs as it will all be on line and the police can quickly check if your car is taxed or not. It is a bit like the end of an era really, and I still have some Beauford tax disc holders, so if anyone wants one please let me know (free). Apparently, after 1st October if you are selling your car you can no longer advertise it as being taxed for a year or whatever, as car tax will no longer be transferrable – any buyer will be responsible for taxing any car he purchases himself. Just wondered what all those guys down at the DVLA will now be doing. Shows - 2014 Historic Vehicle Gathering, Powderham Castle, Exeter 12th/13th July We actually managed to get to Powderham this year and I’m glad we did. Lots of cars from over the years and loads of car related stands and autojumble plus rows and rows of other stalls selling lots and lots of different stuff. The only thing which disappointed me was the fact that I did not find the stall selling real Cornish pasties – kept seeing people with them but never actually found them. One thing I did notice though was that the loos were exceptionally clean which is most unusual when you are having to use porta loos. Will definitely go next year. our temporary gazebo for shelter from the sun and our banner there which let people know where we were. The organisers of the show have since contacted me and praised our display of cars which they thought was quite impressive. replacement. However this is not always the case and so I sent him the following on how to check and sort out possible wear and tear without having to replace the actual door hinges. Beauford self-aligning door hinges expained This is a hinge before modification They are manufactured in cast iron in various widths and are left or right handed The Beauford hinge is 51mm (2â&#x20AC;?) wide. The door side flap is cut to length then drilled with counter-sunk bolts welded in (optional) to attach to the door. The pillar side flap is to be cut short and the offcut welded back on at right-angles to provide the attachment to the pillar. Please excuse drawing quality! The hinges are in two cast iron parts, connected by a brass ball which sits in cups machined into the top and bottom parts. A centre pin and spring passes through to complete the assembly. The pin is grooved to take a special locking washer which prevents the nut from loosening when itâ&#x20AC;&#x2122;s tab is bent up against one of the nut flats. To check for wear, lift the door and watch for sideways movement between the top and bottom parts of the hinge. Any movement will have to taken out by bending down the tab washer which locks the nut. This will allow you to tighten the nut against the spring until excess play is removed. If excess wear is found in the ball or spring, replacements can be purchased from http://www.vintagesupplies.co.uk ( check ball diameter before ordering – there are two available sizes 3/4" or 5/8” ) Some Beauford owners have found that the pin in these hinges is prone to rust. A suitable alternative is a 6mm diameter, 65mm overall length stainless steel bolt (61mm under countersink) with a self-locking nut (nyloc). It is advisable to use waterproof grease during assembly. Note that if you wish to get the hinges polished and chromed, do not chrome onto any bolt threads or inside the cup sections or the ball won’t fit the cups and nuts won’t fit the threads! – obvious, but easily overlooked. 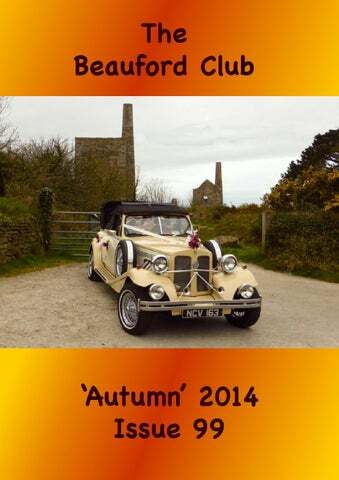 A Beauford with a Difference Michael Crozier Hi there everyone. I have just finished restoring and modifying a Beauford. delighted with the result that you can see below. seconds. Actually, I have stretched quite a few Beaufords in my time to give more room inside. However, to date, they have always been 2 door models and I made them into 4 door Beaufords by adding mini doors to the rear. But, this one was to be different; a 4 door model to become a stretched 4 door. more height would be welcome so that hair styles and tiaras don’t get messed about when entering car. strength (pic 5). We fabricated a small section including a small window and welded it in place. We used the old rear doors, cutting them in half and fitting them to each side. We used angle iron and steel barÂ for the hinge panel and door shunt. We welded this to the steel inner sills. We also lengthened the chassis with same size and thicknessÂ plate, (pic 6). Next, we had to dress and grind all the welds flush. for new hood. We altered a pair of hood irons to fit (pic 9). Next, we fitted a new floor including a fabricated tunnel. Finally, the car was fully primed and finally ready for paint (Pic 10). Hey presto look at the fist picture. It isn’t too bad is it? (ed). IVA Re-test I had everything ready by the end of the week and booked a re-test, the earliest slot available was for 8th November! I took the car for the test, he checked the failure items, was happy I had actioned them and told me to wait in the office while he wrote the paperwork because it had passed! The next challenge is getting it licenced for the road. I had heard stories about the DVLA being difficult, but my experience was just the opposite. I found that you can't download all the forms you need from the web so the day after the IVA re-test I rang the DVLA and they said they would post them out to me. It was Friday, I figured it would take a few days so I drove to the Birmingham office. I may have been just lucky, but the first person I spoke to happened to be the guy who inspected the cars. He was really helpful, he gave me the forms I needed, advised me how to complete them and what to include. I returned the forms the following Monday, they were checked and I was gived a receipt. I received the letter advising of the inspection appointment on the Thursday after for the following week 22nd November. Then on the Saturday I received the forms from my phone call to the DVLA in Swansea, I'm glad I went down to Birmingham! I took Twiggy down and put it in the allotted parking space and advised them I was there. They told me to wait with the car and someone would be out shortly. He came out, checked the VIN number, the engine, had a look round said it was a nice car and said he would send it out in a couple of days. All done! The reg number and tax disk came two days later. Twiggy has been reborn a POK! Sensor corroded ABS - The donor car was fitted with ABS. All the sensors were corroded and would cost ÂŁ160 a wheel to replace. On talking to the guys at Beauford, they advised me not transfer it to the kit. Apart from being expensive they said other clients had had problems with getting the ABS through IVA. It almost decided me to do the opposite because I love a challenge, but in the end I decided to benefit from someone elseâ&#x20AC;&#x2122;s experience. A period car wouldn't have had it, so that's my excuse! completely gone off) I drilled and thredded the original bolt into it and left it to harden. It seems to have done the trick, I must remember not to try any "Dukes of Hazzard" jumps! Engine Mountings - The kit was supplied with replacement fabricated engine mountings to suit my 2lt DOHC. The standard mountings put the engine too close to the steering shaft and the alternater fouls it. The ones supplied with the kit were slightly out of alignment and wouldn't bolt in place. I had to slightly enlarge the holes before I could get them in (both sides). They were drilled for the rubber and also for the pin to stop them swivelling, but I couldn't get them to fit into the chassis, I had to modify them again. cross section of gearbox mount Gearbox mounting bracket - The manual says bolt to the angle iron in the chassis, but either my bracket is too narrow or the angle iron is too far apart! I've bought some 8mm thick mild steel bar from B&Q (thinner would probably be adequate), heated, bent and shaped it, then cut it into appropriate plates, to clamp the bracket to the rail. If I could weld, I would weld the plate to the chassis, but it should be ok. There can be no sideways movement because the bolts are against the chassis, longitudinal movement would be restricted by the engine mounts. That's my reasoning anyway, but I managed to get a slightly smaller bolt in to secure it instead of welding. Heater modification - The heater is normally in two parts with the blower motor under the bonnet and the heater under the dash. The two units don't actually fit together, so I started working out how make mould a plate out of fibre glass that would do the job, shaping it around some plywood etc. In the end I just cut the ply out, shaped it, varnished it and bolted it together with frame sealant on the joints (the normal sponge seal was perished). It does the trick. I've just got to fabricate some brackets to mount it in the car now. Wiring Loom - I had purchased a new generic wiring loom details of how I fitted it can be found on the electrics page. Talking to various people the most common solution seems to be to throw out the engine management system and the fuel injection system and replace with a standard loom and carburettor. I didn't and it caused a real headache at the time, but I'm glad I did it now.